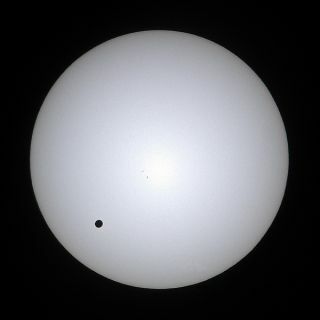 Watching the tiny silhouette of the planet Venus slowly cross the face of the sun doesn’t evoke the same drama and excitement as experiencing a total solar eclipse, but what makes a transit so unique is its rarity and historical significance. Tomorrow's historic transit of Venus across the sun's face has astronomers and skywatchers abuzz, but how spectacular would it be to see our own planet silhouetted against the solar disk? Venus will pass in front of the sun from Earth's perspective on Tuesday (June 5; Wednesday, June 6, in much of the Eastern Hemisphere), marking the last such Venus transit until 2117. However, there's a chance to observe an Earth transit less than two years from now using a little creative thinking, some researchers note. In January 2014, Jupiter will witness a transit of Earth. And we can see it too, the astronomers say, by training NASA's Hubble Space Telescope on the huge planet and studying the sunlight it reflects. A transit of Earth would be an unprecedented skywatching spectacle, but the main allure of the event for scientists is the chance to see what the atmosphere of a habitable (and inhabited) world looks like from afar. This information could help astronomers in their search for life on distant alien planets, Pasachoff said. "We would try to detect Earth's atmosphere in that way, which would be a real analogue to finding an Earth-like planet around another star," he told SPACE.com. Hubble is already gearing up for a similar observation of the coming Venus transit. The instrument is too sensitive to be pointed anywhere near the sun, so scientists will use the moon as a mirror. The goal is to see if Hubble can determine the makeup of Venus' atmosphere, which is well-studied, in a test of how well the technique can be applied to exoplanets. The Hubble Space Telescope in orbit. Watching the Earth transit with Hubble, while challenging, is quite doable, according to Pasachoff. "It's a difficult observation, but we've calculated that we can make the observation," he said. Pasachoff and his colleagues have applied for time on Hubble to watch a September 2012 Venus transit in light reflected off Jupiter, as a sort of proof of principle. They should know by June 15 if their proposal was successful, Pasachoff said. "We're hopeful, but we're mindful of the oversubscription rate," Pasachoff said. If their bid fails, Hubble likely will never get to see an Earth transit. The next one from Jupiter's perspective won't occur until 2026, and the venerable instrument — which launched in 1990 — is expected to shut its eyes before then. "This is the last one that would happen within the lifetime of Hubble," Pasachoff said. Editor's note: If you snap a great photo of the Venus transit and would like to share it with SPACE.com for a story or gallery, please send images and comments to SPACE.com managing editor Tariq Malik at tmalik@space.com.